We offer the highest quality legal work and personal client service. The Firm is committed to providing you with top notch advocacy. We approach every client with a focus on integrity, trust, and understanding. We fight for you! The Firm, and its principal, have a well-deserved reputation of excellence in providing smart, sensible, and cost-effective legal and business solutions for our clients. 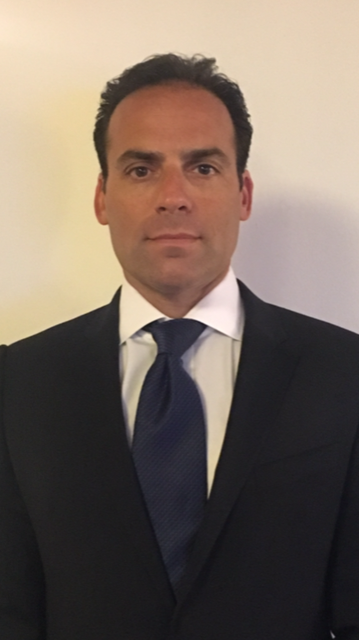 Joshua H. Grabar has extensive experience as counsel in complex commercial litigation in state and federal courts throughout the nation, with a particular concentration and emphasis in individual and class action litigation under state and federal antitrust laws, federal securities laws, and state consumer protection laws. Mr. Grabar has also represented plaintiffs and defendants in a broad range of other commercial litigation, including breach of contract litigation, litigation involving claims for coverage and indemnification under Directors and Officers liability insurance policies, disputes involving business torts and other unfair and deceptive business practices, claims involving alleged breach of fiduciary duty and misuse of corporate assets by corporate officers and directors, and claims involving private and public sector employees with respect to whistleblower protection laws. Mr. Grabar also advises individuals, business owners and corporations on matters concerning antitrust compliance, retention of antitrust claims and recoveries, and consumer protection law compliance issues. Mr. Grabar is a graduate of the University of Pennsylvania (B.A. 1995) and the Villanova University School of Law (J.D. 1998), where he served as an Associate Editor of the Villanova Law Review. Mr. Grabar authored the publication "Antol v. Esposto: The Third Circuit Expands Preemption Under The Labor Management Relations Act," 42 Vill. L. Rev. 1995 (1997). Mr. Grabar was admitted to both the Pennsylvania and the New Jersey bars in 1998. He is a member of the American, Pennsylvania and Philadelphia Bar Associations and has been admitted pro hac vice in federal courts nationally. Specialties: Class Action, Price Fixing, Antitrust, Consumer Protection, Securities Fraud Litigation, Compliance. The Firm serves a wide range of clientele, and every client relationship is valued greatly. Each engagement benefits from the depth and breadth of our expertise. Mr. Grabar represents businesses and individuals injured as a result of violations of federal antitrust laws, securities laws, and consumer protection laws. Mr. Grabar also advises businesses and individuals with respect to legal compliance, claim retention and recovery. In Re: Generic Pharmaceuticals Pricing Antitrust Litigation, 2:16-MD-2724-CMR (E.D.PA.). An antitrust class action alleging that generic drug manufacturers conspired to fix and raise prices for numerous generic drugs, forcing consumers to pay artificially inflated prices for the medications they rely on, many of which have seen price increases of over %1000 in just the last few years, without any underlying shortage in raw material or increase in demand. In Re: Blue Cross Blue Shield Antitrust Litigation, 2:13-CV-20000 (N.D. Ala.). An antitrust class action filed on behalf of Blue Cross and Blue Shield subscribers in several states who purchased individual and small group full-service commercial health insurance which seeks to enjoin the Blue Cross and Blue Shield Association and its Blue Cross and Blue Shield licensees from engaging in a continuing conspiracy in violation of the Sherman Act. The case alleges, since at least 2008 through the present, the Defendants have engaged in an anticompetitive conspiracy to establish and maintain monopoly power in thirty-eight states through market allocation agreements. The action also seeks to recover damages suffered by subscribers from inflated premiums that have been charged to them as a result of the conspiracy. In re Cathode Ray Tube (CRT) Antitrust Litig., MDL 1917, 3:07-cv-05944 (N.D. Cal.). An antitrust action alleging price-fixing of cathode ray tubes and finished products containing cathode ray tubes, by the major manufacturers of these products with recoveries exceeding $224 million. In re Steel Antitrust Litig., 08-cv-5214 (N.D. Ill.). An antitrust action alleging market allocation and supply restriction of steel by the world’s major manufacturers of steel with recoveries exceeding $163 million. In re EPDM Antitrust Litig., MDL No. 1542 (D. Conn.). An antitrust action alleging price-fixing of Ethylene Propylene Diene Monomer with recoveries exceeding $100 million. In re Hydrogen Peroxide Antitrust Litig., 05-CV-666 (E.D. Pa). An antitrust action alleging price-fixing of Hydrogen Peroxide with recoveries exceeding $97 million. Alco Industries, Inc. v. DuPont Dow Elastomers, LLC, 1:04 CV 00588 (D.D.C.). An antitrust action alleging price-fixing of Polychloroprene Rubber with recoveries exceeding $36 million. In re Polychloroprene Rubber (CR) Antitrust Litig., 3:05-MD-01642 (D. Conn.). An antitrust action alleging price-fixing of Polychloroprene Rubber with recoveries exceeding $15 million. In re Methyl Methacrylate (MMA) Antitrust Litig., 2:06-MD-01768 (E.D. Pa.) (recoveries exceeding $15 million). In re Mercedes-Benz Antitrust Litig., 99-CV-431 (AMW) (D.N.J.) (recoveries exceeding $17 million). In re Rubber Chemicals Antitrust Litig., 03-CV-1496 (N.D. Cal.) (recoveries exceeding $250 million). 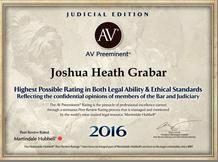 AV Preeminent - Peer Rated for Highest Level of Professional Excellence by Martindale-Hubble. Recognized as having the highest ethical standing. 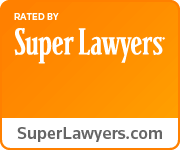 Super Lawyers - Mr. Grabar has been honored to be selected in 2017, 2018, and 2019 as one of Pennsylvania's Super Lawyers by Thompson Reuters' Super Lawyers publication. Each year, no more than 5 percent of the lawyers in the Commonwealth are selected to receive this honor.​ Mr. Grabar was previously honored to be selected in 2010 and 2013 as one of Pennsylvania's Rising Stars by Thompson Reuters' Super Lawyers publication, recognizing him as one of Pennsylvania's top up-and-coming attorneys. Each year, no more than 2.5 percent of the lawyers in the Commonwealth are selected to receive this honor. Designation as a Rising Star and a Super Lawyer is recognition that Mr. Grabar has distinguished himself with respect to his achievements as a practitioner and advocate in the eyes of the legal community in which he practices. Joshua H. Grabar is focused and driven to maximize recoveries on behalf of victims of price-fixing, securities fraud and consumer fraud. We are at the forefront of ever-evolving class action landscape and work closely with our clients and colleagues within the legal community to consistently exceed client expectations. Mr. Grabar is proud that so many of his clients have repeatedly turned to him for counsel and representation. He and the Firm work hard to earn their loyalty every day.